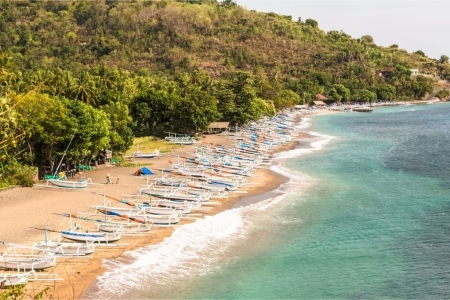 Amed is located in north east of Bali Island, about 120km from the airport, roughly 3 hours drive. In the past, Amed was an area with famous as a sea salt manufactures. But nowadays, Amed is more famous as an area for diving and snorkeling. The calm black sand bay of Amed is home for beautiful reefs with soft and hard corals and a variety of fish. There are 2 famous spots in Amed where you can start your snorkeling experience: Jemeluk Bay and Japanese Ship Wreck. Do snorkeling in Amed is recommended, as it is the easiest way to see and explore Bali underwater world. Jemeluk Bay does not have big waves and strong current, this is the best place for you who would do snorkeling for the first time, as you don’t need to rent a boat, just walk straight from the shore and you will see lots of big and colorful fishes swimming around you. The unique thing you can find in Jemeluk Bay is a underwater post office; a home for fishes. The local people put it as a part of the snorkeling attraction in the bay. 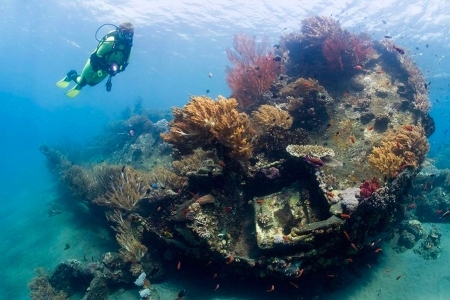 One of the Japanese shipwrecks from World War II is located only 15 minutes from Jemeluk Bay. The Japanese shipwreck is covered in growth, with stag horn corals on the shallow part of the wreck playing host to a variety of fish, crabs, starfish and other tropical critters. Shipwreck is also a great place for beginners who want to learn to dive because the wave are not too big and the water is very clear. There are so many spots here in Amed either to do snorkeling or diving, and you can easily find a restaurant near the beach (rent snorkeling equipment), you can drop your bags there, go snorkeling, and when you got hungry.. The restaurant is just in front of you.